Without the right professional experience or plumbing equipment, problems with your plumbing system can definitely be hard to pinpoint. Most of the system is hidden from view, after all, and the issues that usually impact it are subtle to start. This is part of the reason we stress how important it is to schedule routine preventive maintenance with a professional plumber in St. Peters, MO each year. However, even with maintenance, you may run into a plumbing problem, which is why it’s so vital for homeowners to know what signs to look for that indicate a problem. This way, if something does happen between maintenance appointments, you can get it managed sooner rather than later, which is always a good thing when it comes to plumbing and water damage! So, what symptoms should you watch for? A drop in water pressure is never a good sign. It could mean a lot of different things, depending on how severe the drop is. Usually, a slow decline in water pressure means you have a leak or blockage in your plumbing that’s been building up over the months. This could be limescale, among other possibilities (depending on which area of the home it’s happening in). A sudden loss of water pressure is even more alarming. First it’s important to make sure that there isn’t anything going on in your city that might have caused this loss of water pressure, particularly if it’s affecting your whole home. If that’s not the case though, it could mean you have a ruptured pipe or broken connection. 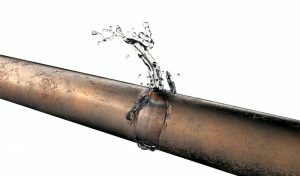 Turn off your water main as a precaution, and call in a professional! Be sure to keep a close eye on your water bills each month, just in case they begin rising unexpectedly. Water bills that seem to be exceeding your average spend might mean that you have a leak somewhere in the system. If your monthly utility bills show you’re using substantially more water than you are or think you are, it’s time to have your plumbing system checked. One easy way to test if your plumbing system is leaking is to turn off all the plumbing appliances and equipment in your home. Make sure your toilet isn’t running, nor your dishwasher or washing machine. Now, check your water meter. If the meter is still running, it means that water is still leaving the system somewhere, and it could be in the form of a leak. We hope it never comes to this, but the unfortunate fact of the matter is that sometimes, you won’t detect a plumbing leak until you actually see signs of the damage it’s causing. Pinhole leaks and other seemingly minor problems like this are the worst offenders. Sometimes, you may not even notice “smaller” leaks until they’ve rotted out the surrounding area with water damage. If you do notice any signs of water damage on your walls, ceilings, flooring, or near the baseboard, then it’s time to call in a pro to check on it. Remember, the longer you wait, the worse the problem will likely get! Performance Plumbing offers a full range of plumbing services. If you suspect that you need plumbing repairs or want to learn what your service options are, don’t hesitate to contact us to schedule an appointment!